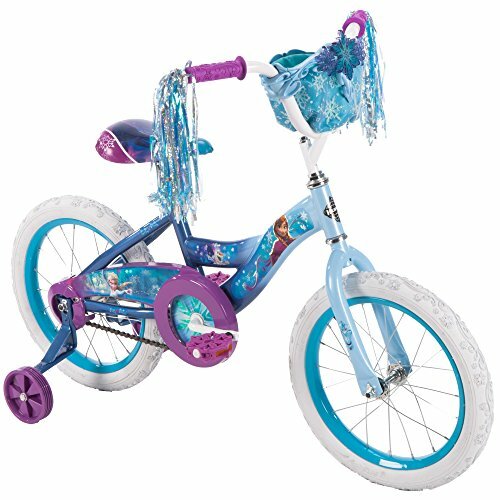 Disney 16 inch frozen bike has a "steel curved "Y" frame with rear coaster brakes, padded seat with graphics, 16" sidewalk tires with 20-spoke rims, removable Disney frozen shimmery basket, snowflake grips, pedals and tires. Alloy quick release seat post for easy height adjustments, training wheels an ed streamers. The Disney Frozen cloth handlebar basket is a beautiful accent to the bike, plus it's roomy enough to carry her treasures. Multi-color shimmering streamers, the translucent snowflake handlebar decoration, snowflake pedals, and grips all make it so much fun! The 16" white sidewalk tires with unique snowflake tread and easy-to-use rear coaster brakes make riding comfortable for beginning riders. Fully decorated with Disney Frozen graphics, the durable steel frame is built to last, and backed by our limited lifetime warranty.